Rather than a simple switch or dimmer for each lighting circuit, mood lighting systems use a single button to select the mood with pre-set dim levels on a range of lights. After all, when you set the lights in a room, it is usually a particular mood or scene that you are wanting rather than controlling individual lights. 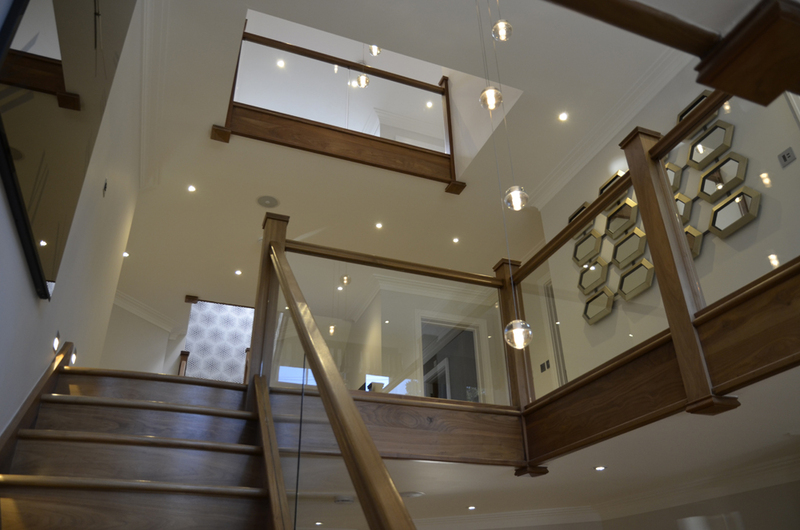 We have a range of lighting systems to call on depending on cost and wiring schemes etc. These can be controlled via conventional wall plates, remote control, or connected to a control system for control via a remote or iPad etc. These systems are able to include sophisticated timed sequences, and can record a week or two of activity for your lighting system to replay whilst your are on holiday to make it appear that someone is in. 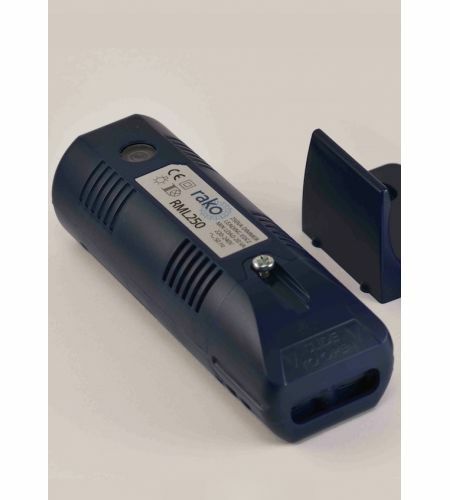 Rako Controls have a variety of mood lighting system components that can work with each other or independently. One of the things that we like best, is that it is possible to retro-fit Rako Controls dimming packs into existing conventional house wiring, without having to re-wire the lighting circuits. They offer a robust wireless link between dimming modules and switch positions, which makes it easy to add circuits and switches as required. Lighting system switch plates come in a variety of surface or flush mounting panels, with finishes to match most standard electrical wall plates. The switch plates fit into standard UK wall boxes, however with the radio interface and a battery powered switch (with a typical 5-year life), they can be mounted wherever you choose. Lighting system dimmer modules come in leading and trailing edge varieties, as well as dedicated switching, and LED drivers, to cover most lighting loads up to 1200W per circuit. The smaller lighting dimmer packs are small enough to fit through a standard down-light fitting, so can be easily concealed in the ceiling without having to cut holes or extend wiring. Rako also have interfaces for curtains and blinds, and remote control including links to 3rd party controllers, for integration into whole house control systems, or control via their App on an iPad or iPhone, or Android Phone. 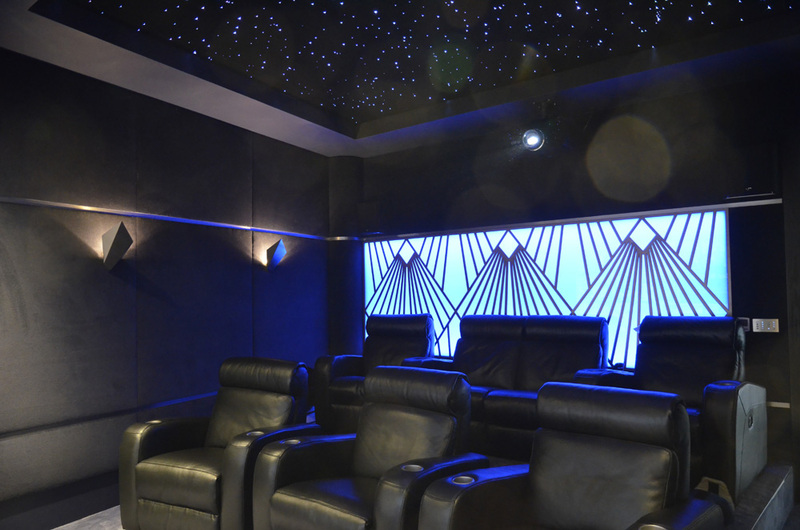 This includes a lighting system DMX interface which allows integration with our Star Ceiling light sources (see bottom of page). The Anylight Mood lighting system from Anytronics in Hampshire is a simple, cost effective architectural mood lighting system comprising of dimming circuit packs, appropriate control interfaces and outstations (wall switches). We like these as the switches are stylish and simple, and the whole system is robust, straightforward and competitively priced. 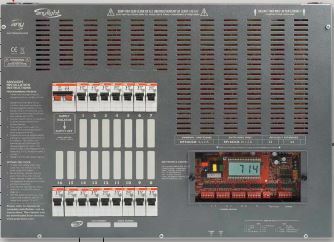 The mood lighting system requires each lighting circuit to be wired back to the lighting control box. These boxes may be distributed around the house, and are interconnected with a Cat5e cable so the system works as a whole. In this way, particular switches may be used to turn off all of the lights in the house in one go. The remote outstations or switches can be either daisy-chained or linked in a star configuration over Cat5e, and can be either circuit controls or scene controls. An RS232 interface allows control from 3rd party systems for integration into whole house control. Other lighting system interfaces are available for Occupancy detection (set a particular scene or light when you walk into a room), Fire Alarm input (all lights come on) or burglar alarm input (all lights flash). Lighting system dimming packs come capable of dimming 2A, 4A and 10A loads, including dimming fluorescent, coloured LED strings, and conventional leading edge dimmable loads. Outputs are protected by circuit breakers for reliability. LED strips have become an easy to use feature lighting system that can be integrated into any of our lighting systems. These thin easy-to-conceal strips are available in multi-colour (RGB or RGBW) or single colour strips at a variety of powers, and numbers of LEDs per metre. LED wall-wash and wall sconses linked to our Mood lighting system. 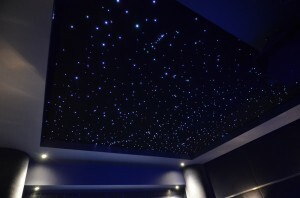 We supply and install star ceilings as part of our complete range of solutions. These are fibre-optic based ceiling panels from our friends at Starscape with ~100 “stars” per square metre. The Sources for these vary, but one of our favourites is an LED based multi-colour source with “twinkle” effect. The LED light source is DMX controllable allowing us to integrate it with the other lights in a mood lighting system, change the colour and intensity, and control the twinkle effect, with spectacular results. 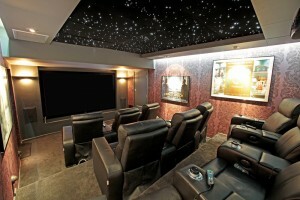 The ceiling panels are covered with a black material finish, making the black, very black indeed. This coupled with the tiny fibre optic light points produces a very realistic star effect. With the star source turned down low and the “twinkle” wheel on, this is a very realistic starfield. 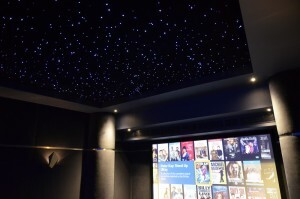 – When it comes to star ceilings, less is often more. If you turn up the brightness, it can illuminate the room, and the ceiling becomes overbearing. 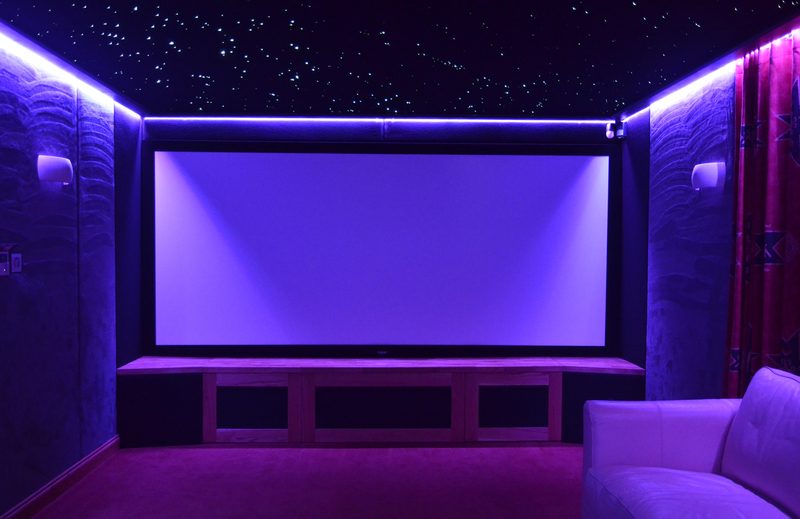 We think it looks best when a more subtle light is shown, so the stars sit in the background adding to the ambience rather than taking centre stage. See our dedicated Star ceilings page for more examples of Star Ceilings we have put up, together with an outline of how they are created. This star ceiling is linked to the room lighting system, with presets to go with the lighting scenes. Manual control can also be implemented to select star colours, intensity, and twinkle on/off and speed.